Jennifer’s daughter Seraphina made her mum a scarf for her birthday, with her very own nine-year-old hands. Of course, there is nothing nicer than a kid-made gift, and this famous mum was keen to show it off ASAP. Jen was snapped by the paparazzi, in full body scarf as she did the school run. She then took to Instagram to explain where her beautiful wrap had sprung from. “When your nine year old weaves a 12 foot long scarf on a peg loom for your birthday present, you’d better #werk #fashionfriday #thecarpoollineismyrunway #proudmom,” Jennifer lovingly bragged and we’ve got to admit we’re feeling a little jealous of her cosy look. The Love Simon star has three kids with her ex, actor Ben Affleck. Their son Samuel is 6, eldest child Violet is 12 and crafty genius Seraphina is 9. They’re a pretty hands-on family, in fact, with Jen regularly uploading videos of herself whipping up delicious treats in the kitchen as part of her addictive “Pretend Cooking Show” series. 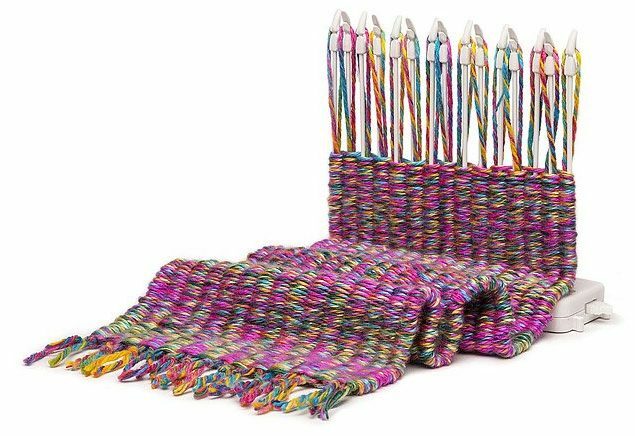 If Seraphina’s scarf has you itching to make something yourself – or coax your child into some crafty fun – you can snaffle a loom for under $40 and weave some magic at your place! It’s not the first time a celebrity has taken a leaf out of their kids’ book in the style stakes. These mini influencers are often found teaching their mums and dads a thing or two, with brilliant results. Justin Timberlake rocked some impressive eyewear, thanks to son Silas and some spiky blocks. Former couple Channing Tatum and Jenna Dewan have been treated to a nifty make-over from their daughter, Everly on more than one occasion. And we’re pretty sure that it’s Blue Ivy calling the shots fashion-wise, not her famous mum Beyoncé.